201 BenedenNAP: Spaced Out Oddities?! 198 BenedenNAP: Maar kun je er ook op rolschaatsen? 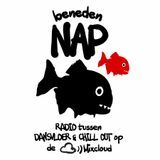 This is a Dutch radio show on the edge of dancefloor & chill out. Recorded in the heart of Amsterdam. Dubstep, house, bass, electronics, techno, electro, ambient and experimental sounds. Start your weekend with some fresh vinyl from the Amsterdam records shops. You can find us here on MixCloud, but also on Intergalactic FM / The Garden! We try to give some extra info on what we play. Who&apos;s who, where does it come from, where to find it. Old fashioned radio? Yes, but that is where our roots lie (VPRO, Human, Studio Brussel). &apos;Beneden&apos; means &apos;below&apos;. &apos;NAP&apos; means &apos;Normaal Amsterdams Peil&apos;, the official Dutch point zero for altitude both land & water. Presented: Roy Mantel, Toon Sackman & Martijn de Natris.